A dish people will rave about for a long time. 2Place the potatoes in a baking rack and cook them until they are completely done, for about 45 min. While they are still hot slice them in half and scoop the steamy inside. Press it through a potato ricer directly to the surface you will be working on. Make a well, add the egg yolks and 1½ cup of flour. 3Start mixing with your 4 fingers pressed to each other, forming the shape of a spatula or large spoon. Add the other ½ cup with flour, mix quickly until the dough is homogenous and doesn’t stick to the working surface. Making the dough should take no more than 1-1.5 min. 4Take 1/3 of the dough and shape it like a ball. Sift some flour on your working surface and roll the ball. Pull some of it, roll it on the table with your fingers and make a “snake” . With a knife cut it into ½“ sections. Shape each piece onto your palms to oval form and then roll it to the outside of a big fork to make the “gnocchi” marks. 5In a large pot boil lightly salted water. Once water starts bubbling place the gnocchi and boil them until they float on the surface. Transfer the cooked gnocchi to iced water for a minute, then drain and place them on a parchment paper. 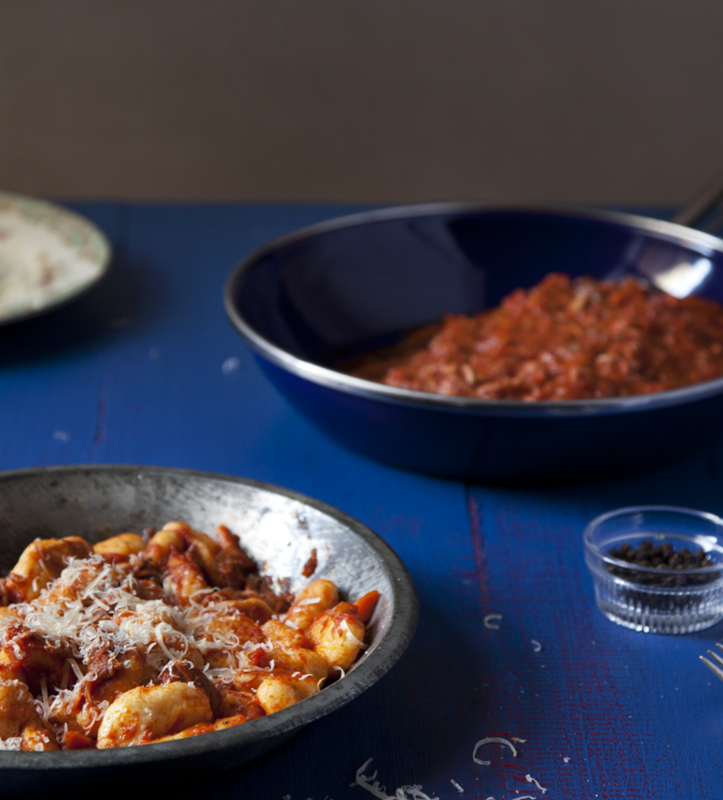 If you don’t want to use all the gnocchi, you can preserve the rest of them in the freezer for another time. 6In a large sauté pan heat 1 tablespoon olive oil. 7Add the rabbit pieces, lightly salted, and cook each side until golden brown. Remove the rabbit. Add the onions, carrots, celery and cook until soft, about 2 min. Combine with the rosemary, thyme, oregano, bay leaf and cook for another minute then add the wine. Mix well, simmer until wine evaporates, then add the tomatoes and the rabbit pieces. Transfer it to a tagine pot or another clay baking pot with a lid. Add water to barely cover the meat. 8Cook for 2 hours with lid on. Once cooked, discard the bones and cut the rabbit meat to small pieces. Return the meat to the thick tomato sauce. 9Heat 1 tablespoon of olive oil in a large skillet. Add the gnocchi and sauté each side until golden brown. Add the rabbit ragu sauce. Mix well, cook for another 3 min then turn the heat off. Cover with a lid and let it rest for another 5 minutes. The gnocchi will absorb some of the sauce. 12In a small saucepan mix ½ cup dry vermouth, 1 tablespoon olive oil , pinch of salt and 6 pealed garlic cloves. Simmer for 20 min.